This is Ron Young’s book on patina’s and a whole lot more for sculptors. Most relating to the silicon bronze casting works. They start with Waxes and Sprues, both large and small sculptures. Choice of Waxes, Wax Working Methods, Sprue systems. They have a lot of good line drawings in the sections so it is very clear what they are talking about. The third section is Mold Making, in which the covers piece molds and then the flexible molds. It is the basics of multi piece molds and the proper way of laying out parting lines, along with the things you has to look out for so you can remove the mold with minimum of problems. In covering the flexible molds they show assorted versions of projects and the problems that can develop if careful thought isn’t given to lay out of the mold. The next section is on Ceramic Shell Casting. Staring with the Virtues of the Ceramic Shell. Ceramic Shell Procedures, Reinforcing the Shell, Drying the Shell, Material and Mixes. Then they discuss the Equipment needed for Ceramic Shell Casting and problems that can develop in Ceramic Shell Casting. They have a number of drawings of equipment that could be studio made. The 5th chapter is devoted to Dewaxing the shells for pouring. From problems in Dewaxing, Dewaxing without a Kiln, Dewaxing with a Kiln and Holding Tank. The types of kilns for Ceramic Shell Dewaxing, They also discuss building a Small Kiln, Designing and Building a Larger Kiln, Safety and Kilns, Preparing the Shell for the Pour. 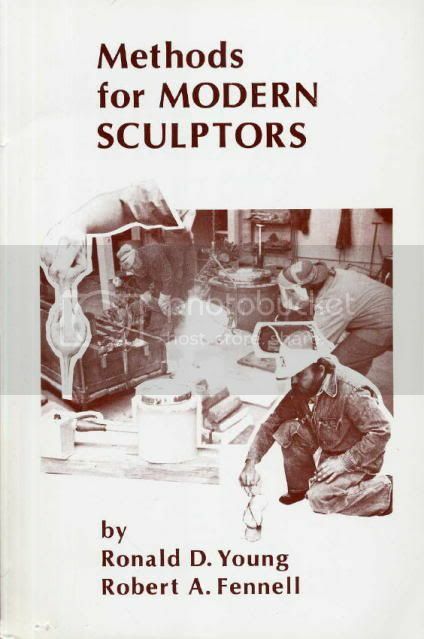 Chapter 6 is the basics covering what you need to do metal melting and pouring a casting. Equipment Needed, the Furnace and Crucibles, Building your own Furnace, Firing the Furnace. Placing the Shells for the Pour, Judging Metals, the types and alloys, along with temperature if you don’t have a pyrometer. Doing the Pour, Cooling, Shell Removal and Diagnosing Problems in the castings either from the shells or gas entrapment. The 7th chapter is dealing with the assemble of pieces that are too large for one pour. Removing Sprues and Vents, Welding, Chasing and Final Sandblasting before patina application. This is a good section for those that haven’t did much casting. So the placement of the vents and sprues can be placed to be hidden as much as possible. Chapter 8 is the start of the finishing phase, both the Polishing and the Patination. Of course there is a good basic grounding of the tools and equipment one needs. Polishing and Buffing is covered, then Patina Effects, along with Preparing for Patination. Covers the Patination Methods, and the assorted draw backs to use them along with the advantages. Variables and Problems that effect the Chemical Patina’s, from the make up of the water, alloys of the metals, to the strength of the patina solutions and the length of time that they are on the piece. To the number of layers of Patina placed over the base Patina. And ends up with Protecting the Patina. The final 2 chapters deal with the assorted Patinas for Metals, and Conserving and Preserving Bronze Patinas. There is also an interesting discussion on what is called Bronze Disease and how to remove it, how to stabilize it. The final chapter is Conserving and Preserving Bronze Patinas, It covers Cleaning a Patina, Stabilizing Bronze Disease, Removing a Patina and Preservation of Patinas. If you are in need of written work on the subjects mentioned, and don’t want to pay the $999.99 price of what seems to be the only copy of Ron’s other book! Then this is a good value. It is listed at his web site store. It also is for sale at a number of sculpture supply houses. My copy cane with a patina color sheet of some other products they sell at his web site. Ordered it. Thanks for the link, Glen. Practitioner of the Electromechanical Arts.